Ashlyn Morgan uses a very unique technique for making a bread structure for her "Bread Week" showstopper bake. To make her Potted Christmas Tree recipe she uses a real flower pot. 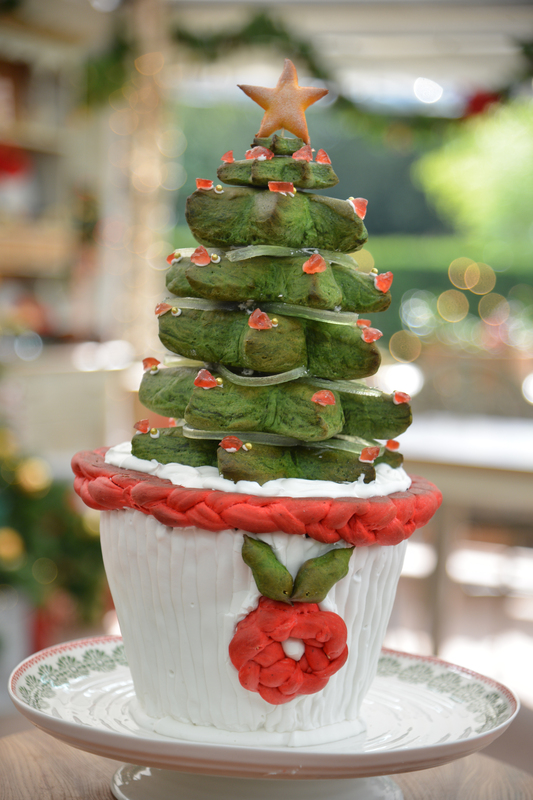 A Christmas tree garnished with candied angelica will rise out of her flower pot baked fruit cake. The judges are concerned about Ashlyn's technique for her bake. Watch the full "Bread Week" episode from Season 2 Episode 3 of The Great American Baking Show to see if she is able to pull off this very unconventional bake. Check out the full recipe below. 1. Preheat oven to 450F/232C. Grease terra cotta pot. Place on baking tray. 2. Chop dried fruits and nuts into small pieces. Add orange zest. Soak in rum while making dough. 3. In a saucepan, heat milk, butter, and water. Let it reach between 110-120 degrees Fahrenheit. 4. Temper the eggs with heated mixture. 5. With a stand mixer with whisk attachment, combine heated mixture with eggs and sugar. 6. Add the yeast. Rest for 5 minutes. 7. Add flour and salt in stages. 8. Use dough hook at medium speed to knead the dough for about 8 minutes. 9. Roll out dough. Drain fruit and nuts. Sprinkle dough with fruits and nuts. Knead until well incorporated. 10. Place dough in pot. Place two cannoli molds in center of dough. Place three dowels inside molds. 11. Let rise for 30 minutes or until doubled in size. 12. Bake for 40 minutes. 13. Let cool and then trim the top to level it. 14. Remove molds and return to oven for 10 minutes. 2. In a saucepan, heat milk, butter, and water. Let it reach between 110-120 degrees Fahrenheit. 3. Temper the eggs with heated mixture. 4. With a stand mixer with whisk attachment, combine heated mixture with eggs and sugar. 5. Add the yeast. Rest for 5 minutes. 6. Add flour and salt in stages. 7. Use dough hook at medium speed to knead the dough for about 8 minutes. 8. For the trees: Take 2/3 of dough. Roll out and color green. Cut out dough using templates (2 XL, 2 L, 1 M, 1 S, 1 XS). Cut out 2 small leaves. 9. For the braids and star: Take a small piece of dough for star and color yellow. Use template to cut out star. Take remainder of dough and color red. Make a long braid to fit around pot. Make a smaller braid for wreath. 10. Bake each tray for 10 minutes. Bake the large braid around the pot (turned upside down with skewers holding braid in place). 1. Whisk the powdered sugar and meringue powder together. Add in the water. Add more water if needed for the right consistency. 2. Fill a 16" or 18" pastry bag with a coupler and use Wilton tips 3 and 11. 1. Place pot on platter. 2. Pipe diagonal lines around the pot in the royal icing using a circle tip. 3. Place a dowel in the center of the pot, leaving enough out to skewer the tree parts. 4. Use royal icing to attach the base tree ring to the pot and skewer it. After each ring, pipe big dollops of icing around skewer for next ring. Place angelica ribbons on rings as you stack. 5. Use toothpick to attach star to top. 6. Pipe small dots of royal icing onto tree tips and use quartered glace cherries and gold candy pearls to garnish. 7. Attach wreath and leaves.